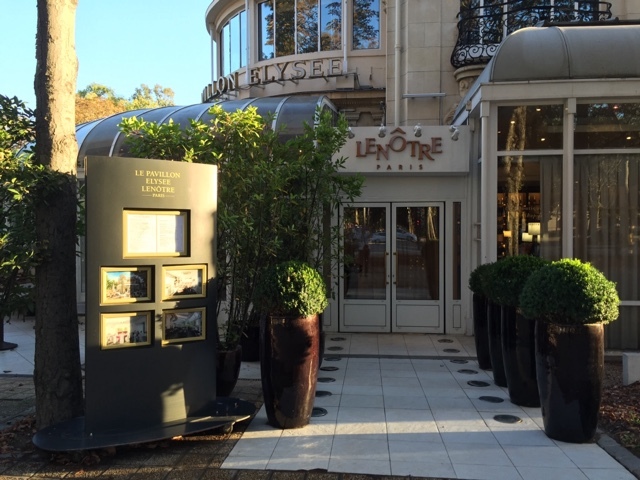 My second class at Le Nôtre's Pavillon Elysée was, of course, one of my favorite topics - tartes! Same place, same kitchen, same chef, different group. My classmates were two women of similar vintage to myself, one Parisian and one American married to a Frenchman. They had both previously attended classes with the same chef instructor so there was some chitchat about how they spent their summer etc. The class was pretty much all in French and, while I understood most, there were times when my head was in a fog and was putting up roadblocks to my comprehension. But, all in all, it went well. 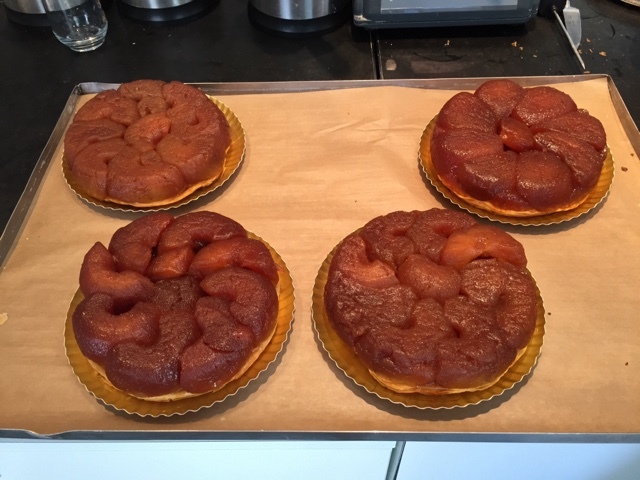 On the docket: tarte tatin, tarte bourdaloue, tarte au chocolat. 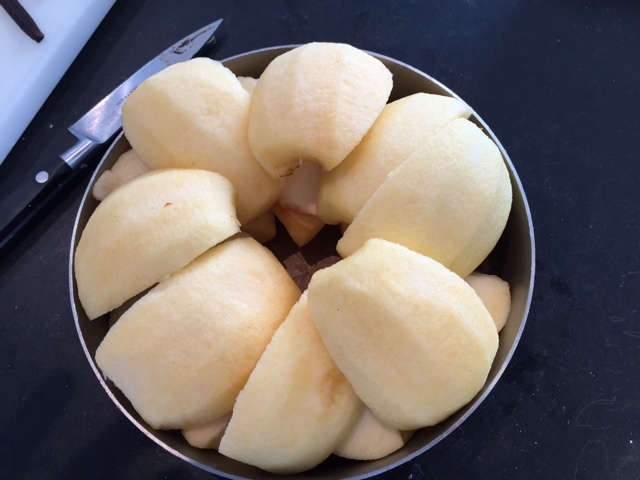 Our first task was to peel and cut up apples and tuck them into a round pan that would ultimately go into the oven. We could choose apple halves standing on end or, as the chef demonstrated, apple quarters in two layers. Next the chef prepared a large batch of caramel which included a bit of pectin. This was a new twist for me, and the chef explained that it helps the caramel set once the tarte comes out of the oven. Interesting. 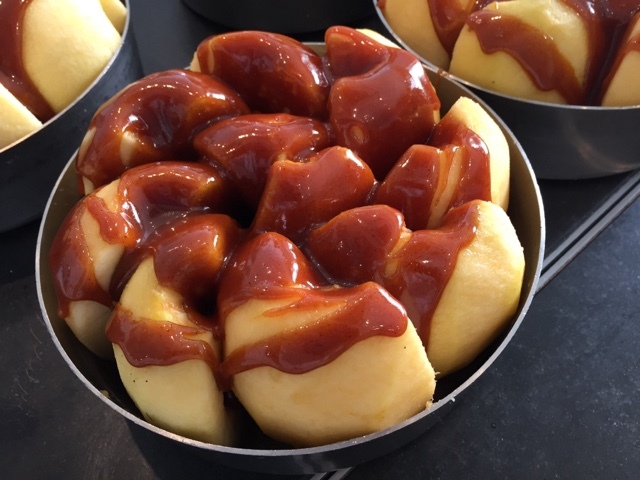 The caramel was poured over the apples and the mélange was baked for about an hour until the apples were nicely baked through. Then a round of puff pastry was placed over the cooked apples and the whole she-bang went back into the oven for another 20 minutes or so until the puff was nicely browned. 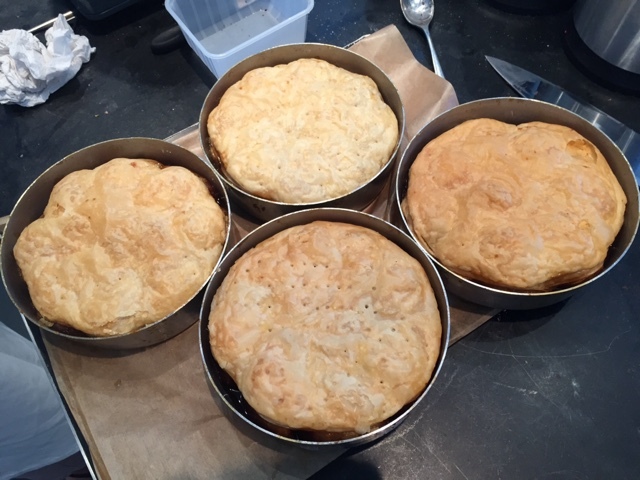 We didn't turn these out of the pans until the end of class to avoid the puff from getting soggy whilst having caramel-y apple goo sitting on top of it. Below are the final results. The top right one is the chef's - he did two layers of apple quarters, and I really prefer the look of that one. Note to self! Mine is the bottom left and should have had the apples packed in more tightly - too many gaps methinks, at least on the left side. 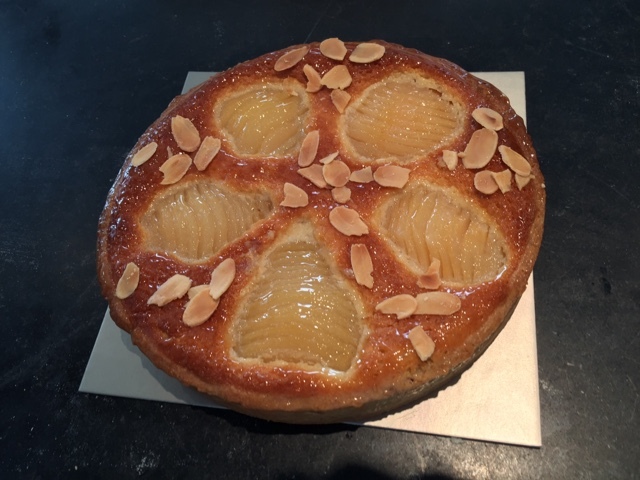 The tarte bourdaloue is a variant of the classic pear almond tart, the big difference with this recipe being that the almond cream filling also contains a hefty dose of heavy cream. 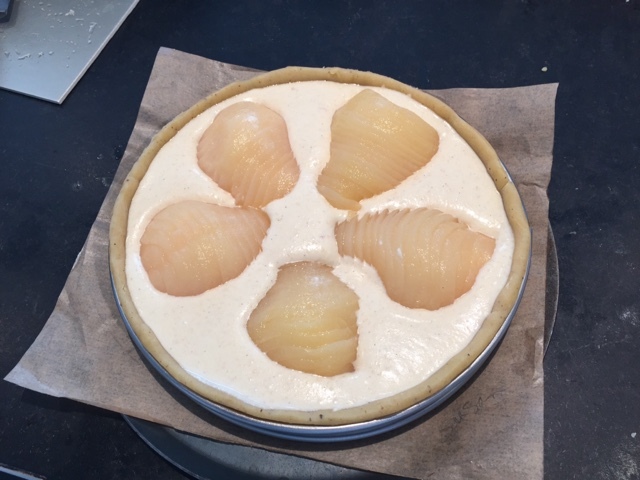 This made for a much more liquid mixture so when we tried to artistically place our thinly sliced pear halves on the filling, they swam around a bit. Once baked however, everything seemed to be in good position, so it all worked out in the end. A bit of glaze and some toasted sliced almonds et voilà! 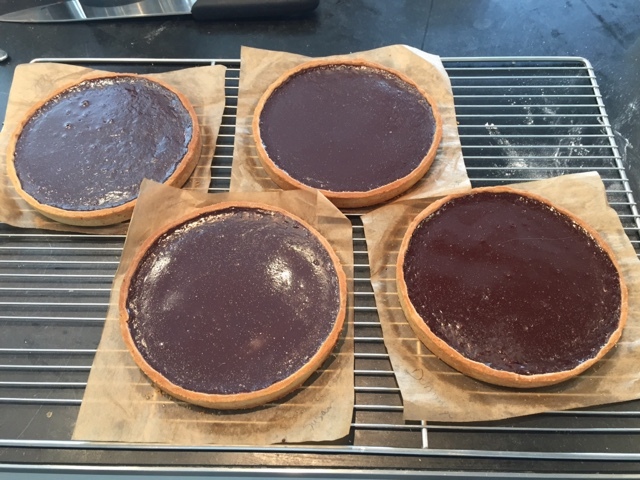 The tarte au chocolat was made with the same pâte sablée as the bourdaloue, first blind-baked then filled with a mixture of chocolate ganache, eggs and vanilla and baked until set. Once cooled we gave it a finishing chocolate glaze. At the end of class we tasted the tarte bourdaloue which I found delightfully light with good pear flavor and a crisp crust. We boxed up our three 7" tarts for tasting at our leisure i.e plenty of dessert for several nights to come (Steve is in heaven). The main thing I took away from this class was the chef's method for lining the open tart rings (which we did for both the bourdaloue and chocolat). 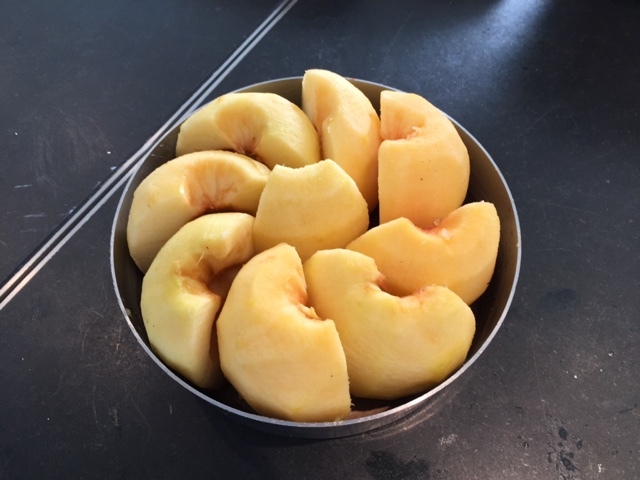 While hard to describe it here, it differed slightly from the way I've been doing it since the days at Pascal's, and I found it quite rewarding. So three cheers for learning new techniques! That's why I continue to take classes when I come to Paris - even though the topic/recipes may be something I've made before, there's always a tip or technique I come away with that makes my baking life a bit more enchanting. And so it goes.